High Ho Silver! New Photos From The Lone Ranger Movie Released! The Lone Ranger” is famous as a hit television series from 1956. But now the masked icon will be making a cinematic debut in a film from “Pirates of the Caribbean” director Gore Verbinski. Like the series, the show will follow the tale of the Lone Rangers and his Native American sidekick, Tonto. The story recounts how the young John Reid becomes the iconic lawman. The film stars Arnie Hammer as the masked man, and Johnny Depp as Tonto. Also featured in this cast are the likes of several stars such as Tom Wilkinson, William Fichtner, Barry Pepper and Helen Boham Carter. Though the film will not be hitting theaters until next July, you can get a chance to get a first glimpse of the new rendition to “The Lone Ranger” by looking at 10 new pictures. 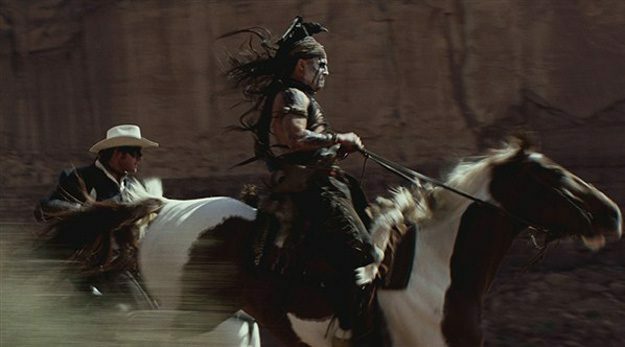 These new images give us the basic sense behind the movie, such as chase scenes across the old west and the connection between the Lone Ranger and Tonto. You can see all the pictures now on MSN. There’s sure to be more from “The Lone Ranger” before the movie hits theaters July 3, 2013.